This complex M&A linked Sweden’s Cevian Capital, Europe’s largest activist investor, with China‘s rapidly growing Geely, requiring cross-border expertise and industry knowledge. An innovative structuring solution achieved Cevian’s objectives of eliminating regulatory risk and ensuring transaction certainty. Cevian Capital made a full exit from AB Volvo after 11 successful years of ownership and achieved the largest public exit ever by an activist investor. The emergence of a new wave of auto manufacturers, which are rapidly making inroads into global car markets, is transforming the sector. Chief among this group is Zhejiang Geely Holding Group. Geely acquired Volvo Cars in 2010 and has successfully reinvented the marque with a series of stylish models. As well as its eponymous brand, Geely also owns the London Electric Vehicle Company, which makes the iconic London taxi, is the majority shareholder in sports car brand Lotus, and a key shareholder in Malaysia’s Proton. Despite rapid growth, Geely’s reach in the truck and industrial plant sector was limited. Sweden’s AB Volvo, one of the world’s largest manufacturers of trucks seemed a perfect fit; the company owns 45% of Dongfeng Commercial Vehicles, one of China’s largest truck makers. Despite sharing a name, there is no link between Volvo Cars and AB Volvo: the car operations were sold to Ford in 1999, which subsequently sold the company to Geely. Stockholm-listed AB Volvo is closely held so Geely needed to find a willing seller. In late 2017, it made an unsolicited approach to Cevian Capital, Europe’s largest activist fund manager. Cevian, which has around $16 billion in assets under management, acquired shares representing 8.2% of AB Volvo’s capital and 15.6% of the company’s voting rights in 2006. It has transformed the company, making it more competitive, structurally profitable, efficient and valuable. Cevian, which Christer Gardell and Lars Förberg founded in Stockholm in 2002, turned to Nomura for advice. Mikael Dahl, Head of Nordic Investment Banking at Nomura, has known the Cevian’s founders for 25 years, and “had had an active discussion about their investment in Volvo for several years,” he notes. 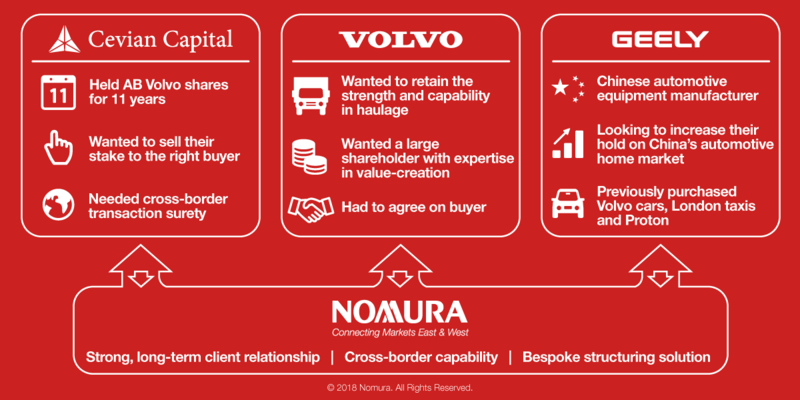 Nomura’s capabilities also dovetailed with Cevian’s requirements, given the complex cross-border nature of the transaction and the importance of relationships on the ground in Sweden and China. 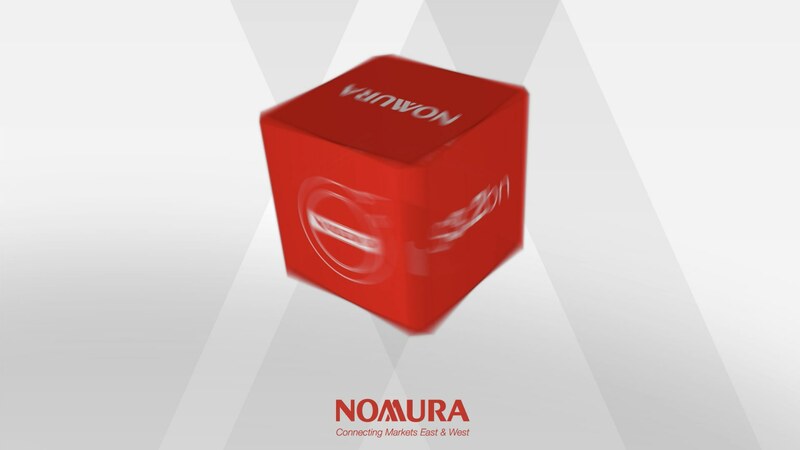 Nomura received the M&A mandate and set about sounding out interest from likely buyers. “A key priority was to assess Geely’s degree of interest, perspectives on valuation and to what extent they had thought through the complexity of such an investment,” says Dahl. As the search for prospective buyers progressed, Geely made its intent clear; it agreed to pay an undisclosed premium above the market value of $3.2 billion. But there was a fly in the ointment. Since 2017, China’s regulators have severely restricted approvals for outbound M&A as part of efforts to stem the outflow of capital from the country and stabilize its currency. The restrictions have curtailed the international expansion of many companies and prompted concerns about the reliability of Chinese bidders in M&A processes. To overcome the challenges associated with approvals from regulators and avoid any potential delay, Nomura’s Equity Solutions team proposed a solution that eliminated the regulatory risk for Cevian, thus providing certainty of proceeds (and completion), that it wanted, explains Giles Gleave, Head of Europe, Middle East and Africa equity solutions at Nomura, which acted as exclusive financial advisor to Cevian Capital on the transaction. “The deal was the first time such a structure was used to address China-related regulatory issues,” says Giles Gleave, Head of Europe, Middle East and Africa equity solutions at Nomura. Nomura’s structuring apportioned risk between the various counterparties while ensuring that there was a simple contract to present to the Chinese regulators. 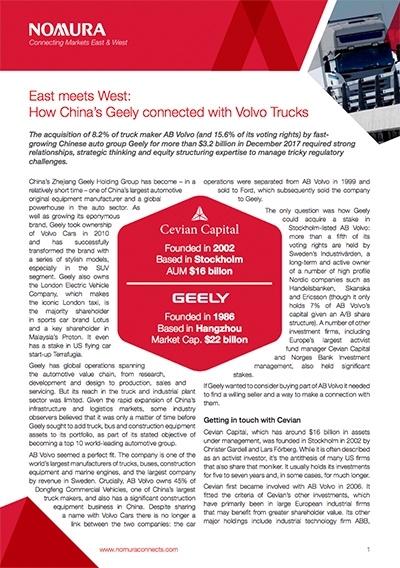 “Working with Barclays Capital as a syndicate partner, Nomura agreed to acquire Cevian’s Volvo stake and committed, using a contingent forward sale agreement, to sell the shares to Geely once the necessary approvals were in place,” says Gleave.